Hot off the heels of reading through Udon Entertainment’s Street Fighter Origins: Akuma - a dark and surprisingly decent take on SF’s most violently raging martial arts demi-god, we step into much lighter (but no less arse-kicking) territory with the same company giving us a side story for another one of Street Fighter’s revered characters - that being the Spinning Bird Kick-ing, disproportionately-thighed female supercop, Chun-Li. Ol’ Chunners is every bit as essential a part of the Street Fighter legacy as the Ryus and Kens of its universe are, having kicked around in the franchise since the very first edition of Street Fighter II. From her heady days as a giddy teenager who got just a little bit too excited each time she won a match, later editions of the franchise would develop her into a far more focused, serious character - one whose role would be centric to the lore of Street Fighter’s world, and which would smash the boundaries of the ‘token chick’ role she was initially saddled with in her debut appearance. She’s one of the few fleshed-out characters in a narrative for a game series that still prides itself on being considerably vague, and that means she’s more than fair game for a dedicated graphic novel under Udon’s mission to give Street Fighter’s back story room to expand. 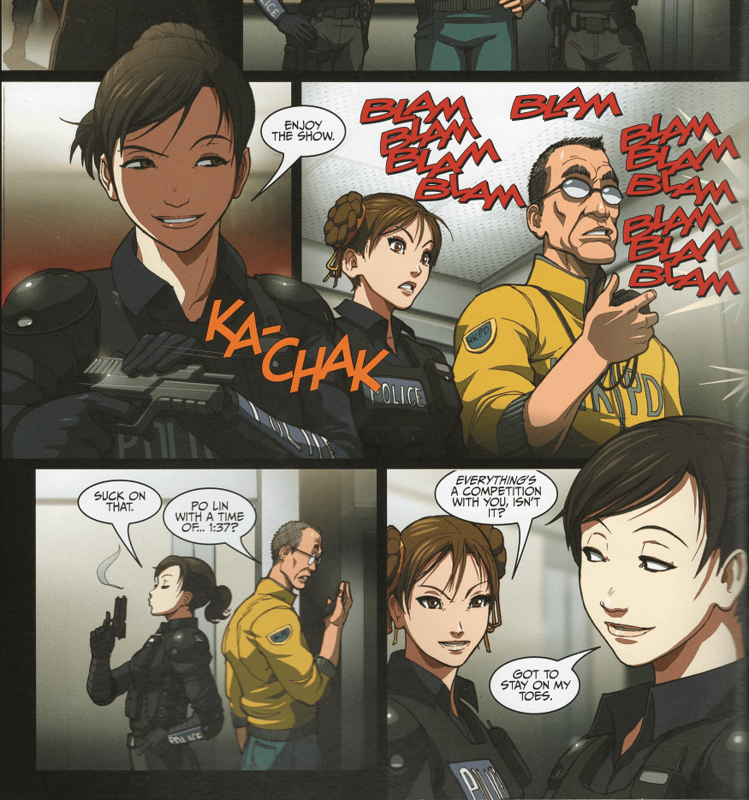 And so, here it is: a four-issue compilation detailing her pre-Interpol days as a young officer keeping the streets of Hong Kong safe, while her detective father - at this point, still very much ‘undisappeared’ - follows a trail that will lead him, and inevitably her, to the underhanded workings of global crime organization Shadaloo. It’s a story that will seem incredibly familiar to any fan of the Street Fighter series, given that it’s pretty much the foundation for Chun-Li’s encompassing character motive within the games, and it’s told here with the same artistic brilliance that was present in Udon’s Akuma offering. Unfortunately though, the meat of its storyline is even more paltry than the one we got with that particular vignette - leaving this more of a gift to the fans, than a good starting point for anyone wanting to dive into the universe of Capcom’s most popular video game title. As any fan would tell you though, the Chun-Li of these days is just as much an able detective as she is an able martial artist. She’s a woman on the hunt to bring down the aforementioned Shadaloo organization, controlled by the megalomaniacal dictator (and frequent game series end boss) M. Bison, for personal reasons as well as professional - her father would end up vanishing while investigating the inner dealings of this very cartel, and only Bison would have the definitive answer to what his fate entailed. Street Fighter Legends: Chun-Li barely scratches the surface of these eventual events however, preferring to tell the ‘what came before’ by means of a straightforward crime-busting tale of both Chun-Li and her father’s initial encounter with Bison’s crime ring. It is Shadaloo’s Hong Kong branch, led by Thai kick-boxing legend and fellow SF icon Sagat (sans his eye-patch), that are planning a rather extravagant heist of the fictional Hong Kong Royal Museum - to spirit away its exhibit of the Terracotta Army statues commissioned by the first Emperor of China, Qin Shi Huang. Bison himself has particularly special interest in the statues, believing them to contain intense spiritual energy (or, to use this universe’s jargon, Psycho Energy - the force that enables all of its characters to Hadoken, Dragon Punch and Psycho Crush their way to victory), and leaves it up to Sagat to procure them for him. 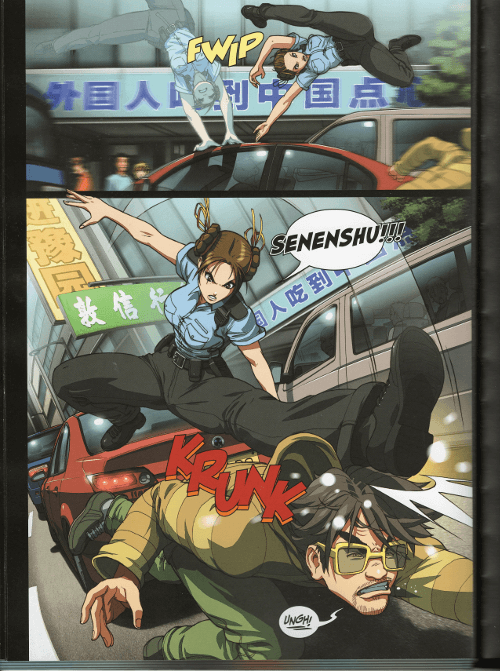 It all seems like a perfect operation in the making given how oblivious the HK police are to the details - until Chun-Li and her best friend, fellow police officer Po Lin, bust a gang of Triad street thugs in cohorts with Bison’s men. Whatever ‘big operation’ both Shadaloo and the Triad have planned, it’s going down very soon - putting both Chun-Li and her father in a race against time to lift the lid on their hijack before its too late. Along the way, they’ll also come into contact with an element Udon most certainly employed just for the sake of fan indulgence - cameos from other members of the SF roster. Fans will also get to see the critical part for the origin story of a certain Dan Hibiki - and in direct association, Sagat’s eyepatch - and the likes of martial arts movie star Fei-Long and cold-blooded assassin-for-hire Gen also wind up involved in the fight to stop Shadaloo’s attempts at grand theft. Readers should be pleased at how convincingly they’ve managed to weave each of these characters into the bigger plot, but they’ll also be rather disappointed at how fleeting these appearances end up being. Fei-Long turns up for barely a fight scene to show off a few signature moves, while Dan witnessing the death of his father at the hands of Sagat is flippantly dealt with in a manner of a few pages. It would have been great to have seen more of both these individuals (yes, even when Dan is meant to primarily be a comedy character), as well as a few more interactions between each of them, rather than just squaring off with the ‘unofficial’ cast of Shadaloo’s thugs. But that is, perhaps, saved for future Street Fighter volumes and collections (none of which I’ve read yet) - this is Chun-Li’s story after all, so the spotlight should be on her rather than a few characters not even considered among the most popular of Street Fighter’s menagerie. Luckily, her main story is at least adequate enough for these four volumes to maintain interest from a storytelling perspective. It is by no means great literature however - pretty much your standard ‘action hero’ cop comic fare aimed at young teens, with a pleasant enough resolution but little to offer in terms of depth. Though it’s fun to see her at this stage in her police career - fresh, eager, but never out of her depth - she isn’t the most entertaining character of her own arc. That title is reserved for her buddy, Po Lin. 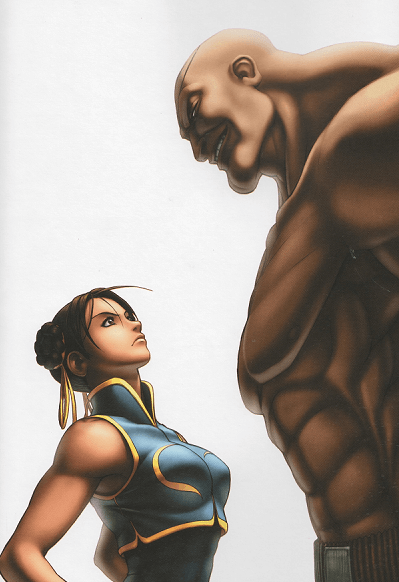 Hot-headed and fiercely competitive, Po Lin is the firebrand to Chun-Li’s markedly more temperate nature. She’s an officer who’s far more likely to break a few criminals’ bones than her martial artist buddy, and even if she is the standard angry cop with a standard reason for her heavy-handedness (she wants revenge against Shadaloo too! ), she’s still a great foil for Chun-Li’s own personality to develop against. 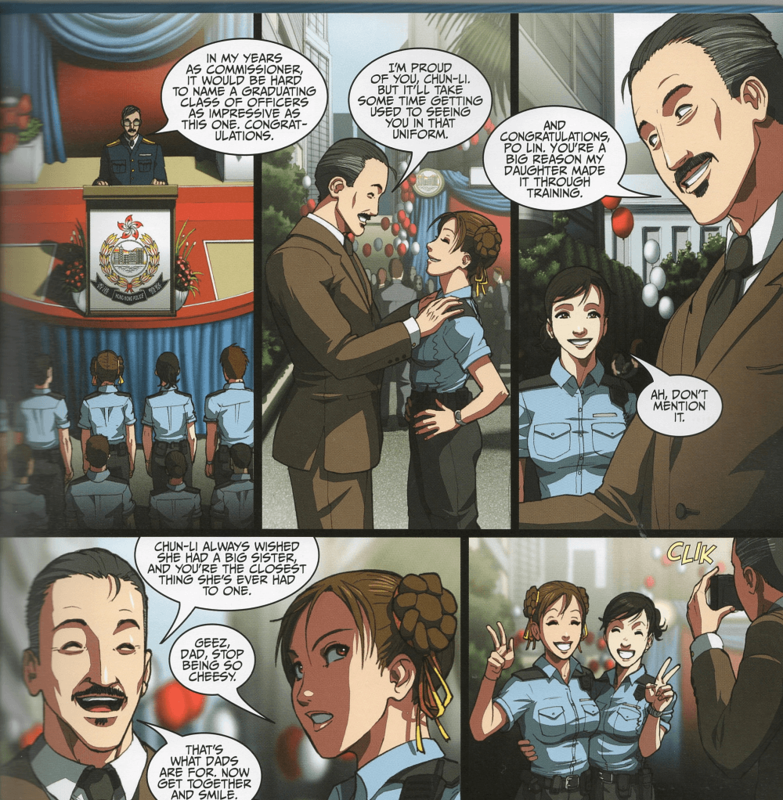 Without her, this story would lack a bit of interpersonal dynamism - Chun-Li’s father, Dorai, is presented as a regular top-class detective, and while the bond between him and his daughter is present, it lacks in nuance. Her warm friendship and relished rivalry with Po Lin is the difference-maker here - without it, the story would probably be a lot less worthwhile. Still, for all of the under-developed characters and bog-standard cop troping, Udon’s artwork lifts everything up a couple of notches. Every single frame of SF: Chun-Li’s pages are well detailed, well coloured and well-sketched, capturing the Street Fighter spirit beautifully with a sense of Western comic dramatics and anime-inspired vivaciousness. But it also adapts itself to the requirements of the story in-moment - bright and lively for the slower, quieter parts, while dynamic and striking for the action. Even if Street Fighter Legends: Chun Li’s plot is uninspiring, it’s worth a purchase for any fan solely as an artbook - Udon artist Omar Dogan can be proud of his work here, because the quality of art alone is enough to keep readers turning the pages to the very end. The turning of such pages also unfortunately reveal just how short everything is - the main story in this volume only lasts four chapters, and could easily have done with a couple more to give its climax a lot more impact. Alongside it are two additional bonus features - a prologue, involving Chun-Li delivering justice to a group of Triad street muggers (complete with hammy dialogue), and a fan service-y, Miss Congeniality-inspired closing skit involving her going undercover at a beauty pageant. Neither of them really add much to the volume as a whole (save for a bit of comedy), but they do demonstrate the general tone of this compilation - fun, lightly entertaining fan fodder that never really gets close to adding subtlety to a world that could probably use a risk or two being taken. 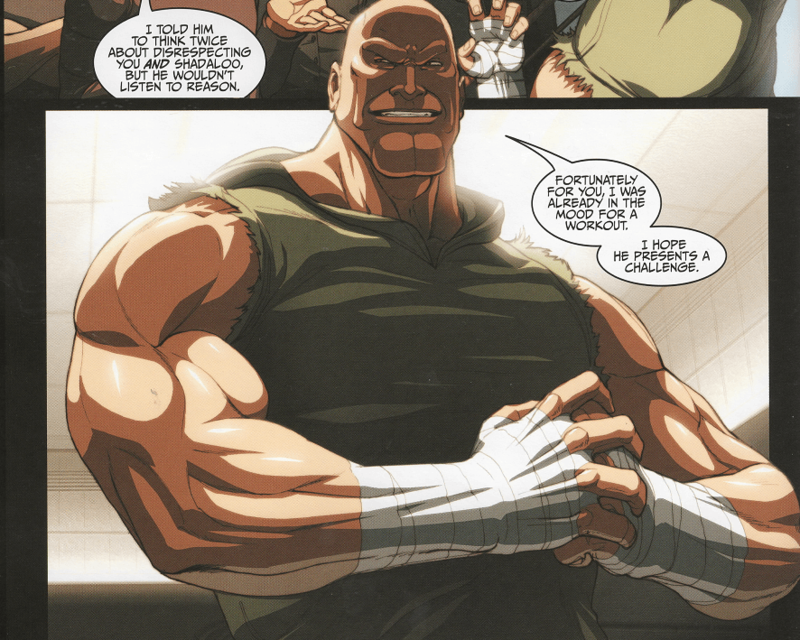 But I do use ‘fan fodder’ in the most positive sense - most Street Fighter followers should come away from this satisfied that this comic novel has done one of their beloved characters some justice. Those who care more about stunning artwork than deep storytelling can probably add a point or two to the score above - as can any young adolescent bitten by the Street Fighter bug. Street Fighter Legends: Chun-Li is most definitely a book aimed at your two demographics, and it hits the target with competence - it’s just those without the love for the SF games will be wondering what the fuss is all about. Street Fighter Legends: Chun-Li is available on Amazon as well as for digital purchase via ComiXology.